Have you ever stepped on an ant hill? As soon as you step on it, millions of ants come flooding out of those tiny little holes that you never knew existed on a random piece of ground you were innocently walking on! What about at a picnic? Have you ever seen a line of ants each holding a piece of food on their back and walking some unknown distance back to their home??? Seeing ants outdoors in St Paul, MN is not surprising. While we may not enjoy their company at a picnic or on a walk, we aren’t surprised when they turn up. One little ant is no big deal, right? WRONG! Sure, ants are just fine outdoors but if any ants start turning up in your home, they can create an enormous problem! Ants can be some of the worsts pests of all time! They can easily invade your home through any type of hole or crack and then the infestation begins! They can create colonies up to 500,000 ants large! No one wants that in their home…if you are noticing ants, it’s time to call a pest exterminator! Eco Tech is St Paul, Minnesota’s best pest exterminator around! We use safe and effective pest control and frankly, we are known for our excellent bug control services. 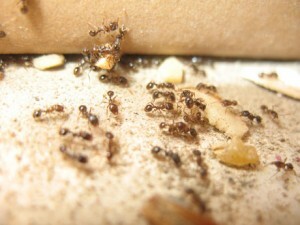 We have been serving St Paul, MN with safe and effective ant pest control for over 15 years. We can tell the difference in ant species within your homes so that we are able to respond with the right type of treatment. We are well trained in locating their nesting location and terminating the colony as quickly as possible! We have a less toxic, organic product line that keeps you, your family and your pets safe all while eliminating the main problem! Our bug control services allow customers to choose all natural or traditional methods for any pest problem they may be experiencing. So if you live in St Paul, MN and start to see ants invading your home…don’t assume that they will go away! Call Eco Tech today at 763.785.1414 for all of your bug control services!